Going through my blogpost draftfolder I noticed this post which I wrote about a year ago. Seeing a lot of time has gone into it I decided to post it anyway. It’s based on Orchard version 1.2, so things might have changed, but the basics are probably the same. Now for the real post. I’ve got a new job where I was needed to create a new CMS website and add some client specific features on it. As Orchard is my preferred choice at the moment, it didn’t take me long to choose which CMS I was going to use. To create some new, custom, features to the website I had to create new Modules and wanted to let them act as a Widget. A Widget in Orchard is much like a SharePoint webpart or an old-fashioned ASP.NET usercontrol. Lucky for me the Orchard team has documented their work quite good, so I could use a lot of code from the ‘Writing a Content Part’ and ‘Writing a Widget’ tutorials. One of the things I was asked to create is a widget which implements the SlideShowPro viewer. This widget is what I’ll use in this blogpost as an example. First thing you need to do, if you want to create a Widget, is to create a new Content Part. A Content Part can be implemented as a new module in your Orchard website. You can use the code generation module for this, but if you prefer to do this manual, that’s also possible. If you choose to do this manually you need to create a lot of folders and files yourself as you need to start off with a new ASP.NET MVC 3 Web Application. The parameter IncludeInSolution makes sure the new project is added to the Orchard solution, however, it doesn’t work on my machine, so I added it manually to the Modules folder in the solution. Description: Adds a SlideShow Pro module to the site so slides can be shown. After setting this up I had to figure out what the model should look like. All content will get uploaded to the site, so I need to specify an URL. This will result in a rather simple and small model with only 1 property, but it’ll do the work. Just add a new class in the Models folder with a proper name and specify the properties you need. If you read the tutorial about writing a content part already, you know you need to add some stuff in the model. For each model you want to use you need to have a class which inherits from the ContentPart<T> class and one which inherits from the ContentPartRecord class. The class which inherits from the ContentPartRecord is somewhat a representation of the table where the information will get stored, sort of a model. The class which inherits the ContentPart<T> class will be used in the views and throughout the code, something like a viewmodel. As you can see I’ll only store 1 string, SlideShowUrl, in the database. This property will have to correspond to the column in the database. In the SlideShowProPart class I’ve defined the SlideUrl to be Requiredso I know it will be available when requested. The SlideUrl retrieves and sets the property of the record which we have specified in the <T>. Or you can just add a new class and call it Migration. I prefer this as you don’t need the extra context switch and it’s faster. The Migration class makes sure the Orchard database is updated after an install or update of a new module. In here you can specify what needs to be created, altered or deleted. First off we need to tell Orchard it has to create a new table with a column named SlideShowUrl and tell it we can attach the content part to any content type. As you can see, an int value needs to be returned. This return value acts as a ‘version’ of your module. If you add a new method which returns a higher number, Orchard will automatically see there’s an update for the module and tell the administrator in the dashboard. Once the module is updated, it stores the new ‘version’ number and knows the module is up-to-date. Can’t really tell if this is a best-practice, but hey, it works! After having created the Migration class we also need to add a Handler to the project. The handler handles events of the content part or is able to manipulate the data model, before rendering the content part. Just as the example in the Orchard tutorial, I don’t need advanced stuff happening here, so I didn’t change the code here. Next up are the views of the content part. Specifying the views is done in something called a Driver. In this driver you can specify which view will be shown for display, edit, summary, etc. All very nice, once you know how this works. The Display and Editor methods are overridden with some new functionality. The shapeHelper parameter is a dynamic type, which means you don’t get IntelliSense from it. I don’t know how the properties are defined on the project, but they work. Maybe I’ll check it out when I’ve got some extra spare time (read: never!). 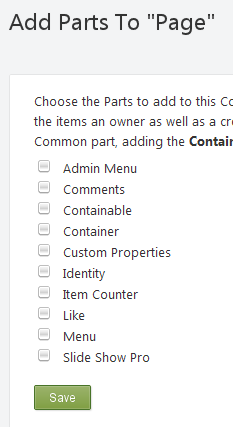 In here you define where the views are located of the content part, “Parts/SlideShowPro” and which model will be used. The last step for successfully creating a content part is adding the placement.info file at the root of the project. This file contains some information on where to locate the views in a larger view. The above example specifies I want the views in the Content block at the 10th position, or in the editor modus at the 7th position. Now, build, deploy, activate and check out of the content part is working. Once you’ve enabled the new module, you can add the content part to a random content type to check if everything is working. 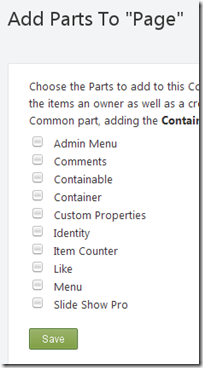 Navigate to the Content Types list and edit one of them, maybe Page. Check the Slide Show Pro box in the list and click Save. When creating a new page you should see a new block on the screen, the same block as you have specified in the editor view of your module. When viewing the new page you should see the display view on the page. So far for the hard part. Once you’ve got a working content part, creating a Widget from this is a piece of cake. Just add the following code to the Migration class, deploy and you’re happy to go. In this piece of code you tell Orchard you want to create a SlideShowProWidget which consists of the SlideShowProPart, WidgetPart and CommonPart. Deploy and update the module! If everything is installed correct you should also see a notification in the Dashboard. So far for my small tutorial on how to add a new widget to Orchard. Lucky for me most of the stuff was already explained in the Orchard tutorials. I added some comments here which I had to find out myself or didn’t quite get from the original. And as always, it’s always good to try things by yourself. That way you’ll get more experience on the matter. If you create a theme for Orchard, it’s only a matter of time before you stumble across a yellow screen of death. I know this, because it happened multiple times to me. One of the reasons for these errors are the dynamic objects, which are used a lot in Orchard. You won’t get compile-time errors with these objects, so they need to be handled with care. Now, when a theme causes a yellow screen you are kind of screwed as you can’t do anything anymore on the website, like logging in to the admin area. Lucky for us developers, the database isn’t obfuscated and we can make rapid changes to it. You can use this script to update your current Orchard theme and set it back to the default Theme Machine theme. Run the above script on your Orchard database and you will be able to start developing again. A few months ago I decided to migrate my weblog from SharePoint to Orchard, because it’s more lightweight and better suited as a simple blog. I also started to develop some custom modules and themes for this CMS and have to say I like it! One thing though, which has bothered me from the beginning, was the empty Archive block at the right side of my blog. I had done so much work to import the SharePoint blog entries to Orchard (a manual copy-paste action), so I knew the posts were there, I could even browse to them. Why was it my posts weren’t visible in the archive block? Today, I found the answer to my problem. It’s a small bug in Orchard when you set the blog to be the homepage of the site. 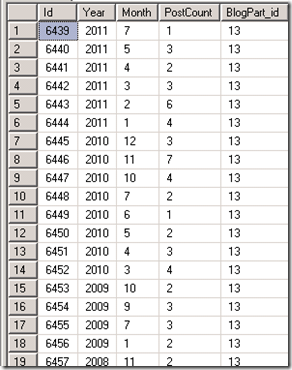 Somehow the records in the [Orchard_Blogs_BlogArchivesPartRecord] table aren’t updated properly. The BlogSlug column should be changed to NULL and not contain the name of your weblog. Note: You probably have got 1 record, but apparently I’ve done some adding and deleting of blogs, so I’ve got multiple. I can probably delete 3 of them, but just to be sure I didn’t. Now, after checking the frontpage again I indeed saw a filled out Archive block. It wasn’t showing the correct/expected data, but at least it had some data in it. In order to retrieve the Archive data, Orchard has a table called [Orchard_Blogs_BlogPartArchiveRecord], which is filled with a summary of posts made in a specific year and month. A nice feature performance wise, but somehow it didn’t had the correct information of my blog. That’s probably because I imported the SharePoint blog entries manual to Orchard and only changed the Created date in the [Common_CommonPartRecord] table of the database. The Archive block probably uses some other columns and maybe even the [Common_CommonPartVersionRecord] table, so I had to change the dates of the other columns in these tables also. 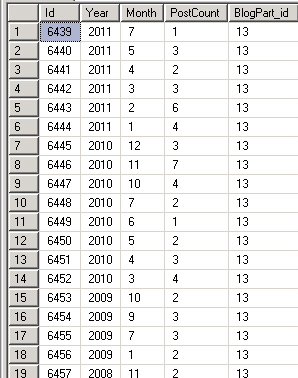 To update the [Common_CommonPartVersionRecord] I had to use a cursor in order to update the columns the way I wanted. Still a fairly easy script, if you know cursors exist in SQL Server. The site still displayed the wrong number of posts per year or month. This didn’t came as a surprise as the numbers within the [Orchard_Blogs_BlogPartArchiveRecord] table were still the same. I thought a search update might help. After rebuilding the search index the Archive posts were still all wrong. Because of the nicely worded methods I was able to figure out I just needed to publish, unpublish or delete a blogpost. After re-publishing one of my posts the Archive block was updated with the correct numbers. And now, the Archives are shown correct. Still the current year doesn’t contain any elements, I’ll need to check out what’s the matter with that. The numbers in the tables are all correct, so it’s probably some other bug.